Today we're experiencing near record low high temperatures under sunny skies with wind chills in the 20's. It certainly doesn't feel like the type of day prior to Thanksgiving, but daytime highs will be warming up significantly the next few days. Unfortunately nighttime lows will struggle to do the same. Let's take a look at some details. To start things off we'll take a look at the national picture. The low pressure system that was giving the Mid-South cold rain the past couple of days has evolved into quite a nasty nor'easter which will impact (guess what?) the northeast today and into tonight which could lead to significant flight delays that could have some ripple effect nationwide. Elsewhere in the U.S., weather looks great for travel. 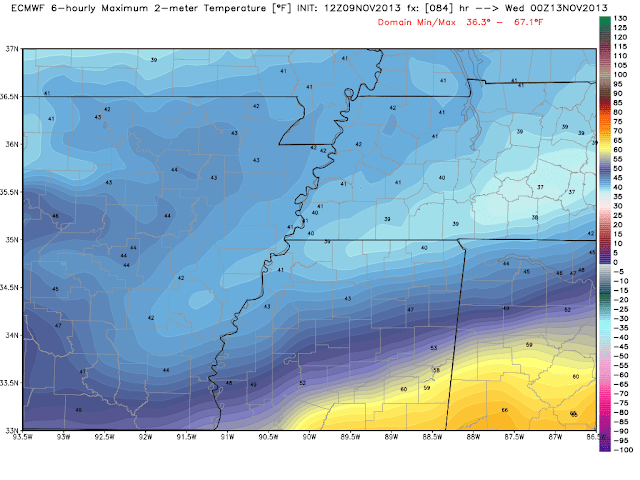 Shifting back to the Mid-South you can see temperatures anomalies (departure from normal) in the image above. These values show quite a significant warming trend the next few days with high temperatures back into the 50's for Black Friday. However, that doesn't mean we're done with the cold! Morning temperatures will still be quite cold with lows struggling to get out of the 20's. If you're an early bird shopper, you'll definitely want to layer up! WESTERN TENNESSEE FROM LATE MONDAY MORNING INTO THE AFTERNOON. That doesn't mean you have to act like this guy! Very cold air resides over the Mid-South as anyone who ventured out for even a few minutes today can attest to. With a high of only 38 and a low of 24, this was the coldest day in Memphis since the first couple days of March. It should be no surprise that Mid-South meteorologists are on high alert and poring over computer model data as a low pressure system moves out of the Gulf of Mexico into the southeast U.S., trailed by an upper level system - a favored setup for winter weather. Those computer models have had a hard time locking in on a solution however, which makes for a difficult forecast. Since there is no one computer model that seems to be the best right now, I'll show data from the high-resolution NAM as I describe what we expect. The basic setup is described above, but a couple of additional factors play into the forecast. First, very dry air in the lowest several thousand feet, all the way to the surface, will serve to delay the onset of precipitation until probably mid-morning Monday. Temperatures at that time (after a low just below freezing) should be in the mid 30s. Rain should be the predominant precip type, however due to the dry and cold air above, some sleet could mix with the rain for a few hours, or until about lunchtime. No significant accumulation of wintry precip is expected in the morning as road temperatures are still well above freezing and precipitation should be mainly rain and not heavy. A 3-D view of temperature and dewpoint at 9am Monday shows temps flirting with the freezing mark up to about 6000 feet, then above freezing from ~6000-8000 feet. 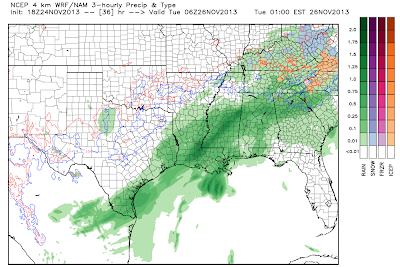 With temps so close to freezing in the lowest levels, a mix of precip types is possible. The high-res NAM model shows the possibility of sleet along the northern part of the precipitation area in the Mid-South at 9am. After the initial shot at winter precip, the Mid-South should see all rain (though cold rain) through the afternoon and evening hours with temps likely remaining in the upper 30s all day. Overnight, as temperatures start to cool slightly and the main brunt of the precipitation begins to pull away, rain may again change over to a sleet/snow mix. Once again, as in the morning, precipitation should be light and tapering off and temperatures should remain right at or slightly above freezing, so no major issues are expected Monday night. Lingering flurries or sprinkles are possible Tuesday morning. 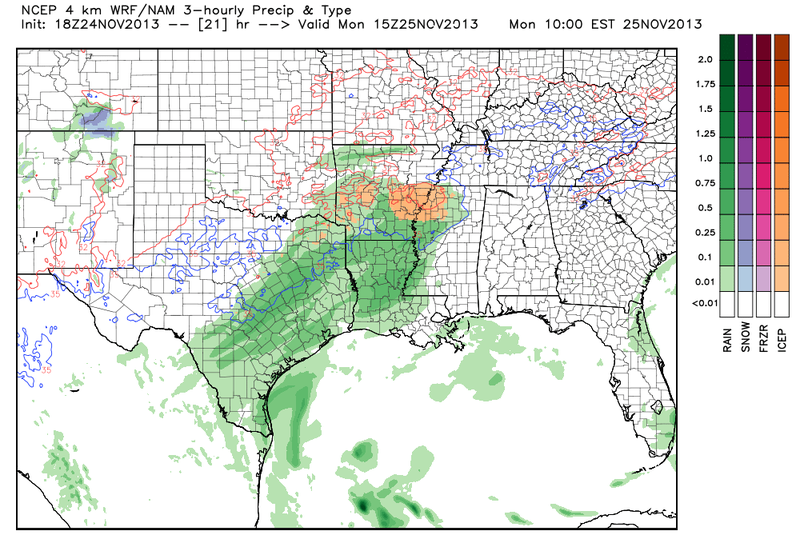 The high-res NAM model shows rain as the precip type at midnight Monday night/Tuesday morning though a light wintry mix is possible after that time as precip departs. Overall, this is not expected to be a major winter weather event in the Mid-South, though some nuisance winter precip is possible Monday morning and again overnight Monday night into early Tuesday morning. Don't be surprised to see light sleet or snow. This system moves east and likely becomes a nor'easter on Wednesday, so those with travel plans for the Thanksgiving holiday will want to keep an eye on flight times, especially in/out of the Northeast U.S. and Mid-Atlantic, where delays or cancellations could stack up. Cold weather will continue in the Mid-South Wednesday and Thanksgiving, though sunny skies are on tap. A warming trend leads us into Black Friday and next weekend. Click here for the full MWN holiday week forecast. Be sure to follow us on Facebook and Twitter for the latest on the winter weather scenario over the next 36 hours (links below). A new experimental ice index will be used at 10 NWS offices in Missouri, Oklahoma, Arkansas, Texas and Tennessee this winter. 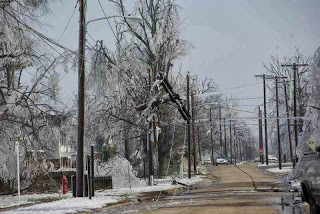 The Scaled Predictive Ice Storm Aftermath Index (SPIA Index, or just "Ice Impact Index"), which will assign a number from 1-5 to a forecast ice event, will gauge potential damage due to ice accumulations on exposed electric utility systems. The index takes into account forecasted ice accumulations and wind speeds - the higher the index, the greater the damage potential from icing. The target audience in emergency management officials, utility companies, and the public. 1 Some local utility interruptions possible...typically lasting a few hours. 2 Scattered utility interruptions possible...typically lasting less than 12 hours. 3 Numerous utility interruptions possible...lasting up to 5 days. Damage to some main feeder lines possible. 4 Prolonged and widespread utility interruptions. Damage to many main feeder lines possible. Utility outages lasting up to 10 days possible. 5 Catastrophic damage to exposed utility systems possible. Outages lasting several weeks possible in some areas. The Ice Impact Index will be issued separately from any Ice Storm Warnings, Freezing Rain Advisories, and other NWS "watch, warning, advisory" products. 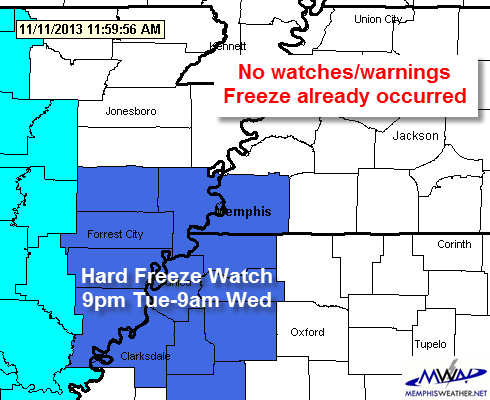 For more details on the Ice Impact Index, visit this page on the NWS-Memphis website. The NWS' official Product Description Document can be found here. Participating offices include: Tulsa, OK; Little Rock; Memphis; Nashville; Norman (Oklahoma City); Jackson, MS; Springfield, MO; Pleasant Hill, MO; St. Louis, MO; and Paducah, KY. The big story for today's blog is the major change in the weather with Friday's cold front. Prior to the cold front, expect above average temperatures leading up to a wet Friday. With the passage of the cold front, expect things to cool down quickly with temperatures becoming well below normal. These are the extremes that are to be expected with fall, but lets paint the whole picture. For tomorrow expect warm conditions with much more clouds than earlier this week. Cannot rule out a stray shower by the afternoon but the majority of the frontal precipitation will hold off until late Thursday night into Friday morning. When it does start raining, expect it to get quite wet with one weather model showing well over an inch of rain in just 6 hours Friday morning. Exact timing and totals should be taken with a grain of salt, but it is worth pointing out the possibility with plenty of moisture present during the day on Friday. Weather Prediction Center forecast total rainfall from 6pm Wednesday to 6pm Friday. The metro is forecast for 1.5-2.0". The Weather Prediction Center is going with right around 1.75 inch totals for the metro. This could change, but as of now it looks like a decent soaking is in store for Friday. Severe weather is not expected on Friday, with even a rumble of thunder being unlikely due to the lack of an unstable airmass during the precipitation. Once the cold front and associated rain clears the area Friday night into Saturday morning, expect temperatures to drop quickly. A stout north wind and mostly cloudy skies should allow temperatures to fall below 40 on Saturday. But as high pressure builds in and the sun comes out on Sunday, don't expect temperatures to be on the rise. It looks just as cold Sunday, with highs near 40 (well below normal as shown in the image above) and lows that morning in the 20's. 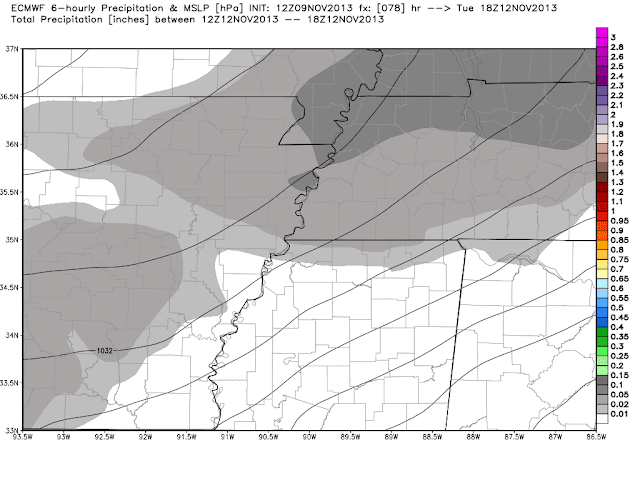 What is perhaps even more interesting is an upper-level disturbance that could bring some brief wintry precipitation to the Mid-South on Monday morning as cold air will be in place and light precipitation is expected. This is much too far out to be getting into specifics, but expect more information as we get closer to next week. 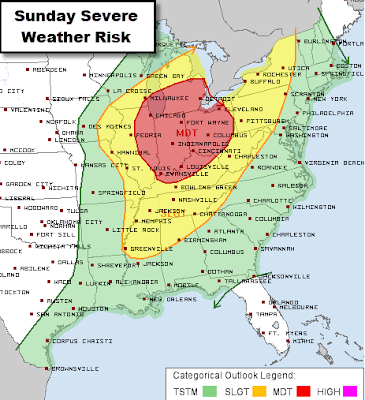 The southeastern U.S. is in the heart of it's secondary severe weather season, but it appears the Midwest, Ohio Valley, and parts of the Great Lakes will have the greatest chance of severe storms on Sunday. However, that doesn't mean we're completely out of the woods in the Mid-South. Overall, my confidence in severe storms in this area, particularly tornadoes, is somewhat low for Sunday. Here's how I expect it to unfold. Warm, moist air has infiltrated the Mid-South on southerly, occasionally gusty, wind today, as temps have climbed well into the 60s. With increasing wind and moisture overnight, don't look for temperatures to fall much if at all, remaining in the 60s with wind gusts to 20-25 mph. Our first round of thunderstorms is also expected early Sunday morning, probably after 3am, in the metro. These storms are NOT expected to be severe, but could wake you up overnight and might produce strong wind to 40 mph or so, but not quite to severe criteria (58 mph), or perhaps small hail. 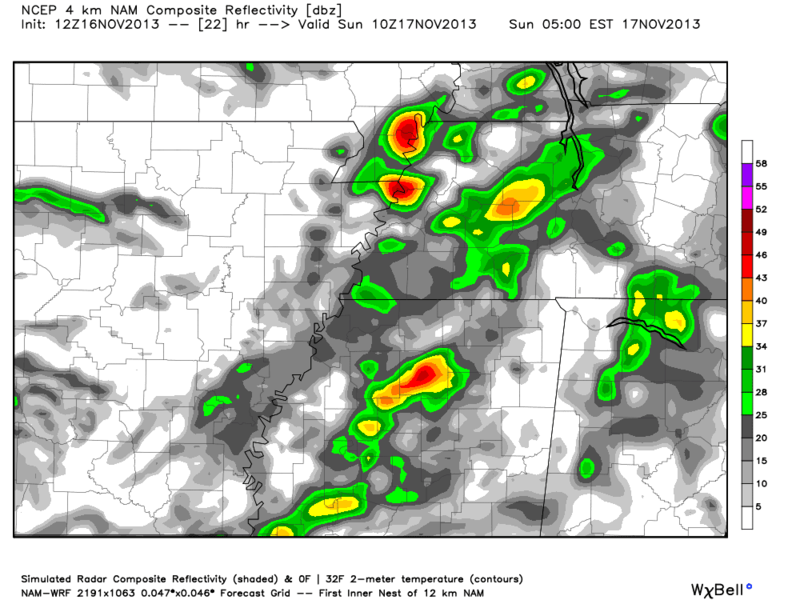 Hi-res NAM model showing "forecast radar" at 4am Sunday. Scattered storms could be in the area by then. Don't take this graphic literally with regard to exact storm location. Showers and storms will be ongoing into the mid-morning hours or so before tapering off as the first impulse moves out of the region. During the day, very strong southerly wind, with gusts to 35-40 mph (Wind Advisory in effect), will push temperatures up to near 80 degrees and a little sun is possible in the afternoon. However, even given increased instability due to warming temperatures, high moisture content, and a little sun, computer models really do not develop additional storms until the cold front approaches. Timing of the front is around 6pm, give or take an hour or two. The same model shown above develops a line of storms along the front pretty much right over the metro (see below). These storms could bring a round of near-severe wind gusts (50-60 mph), though the tornado risk will be fairly low with these storms. Once the front moves through, skies will clear quickly and the storm threat disappears. 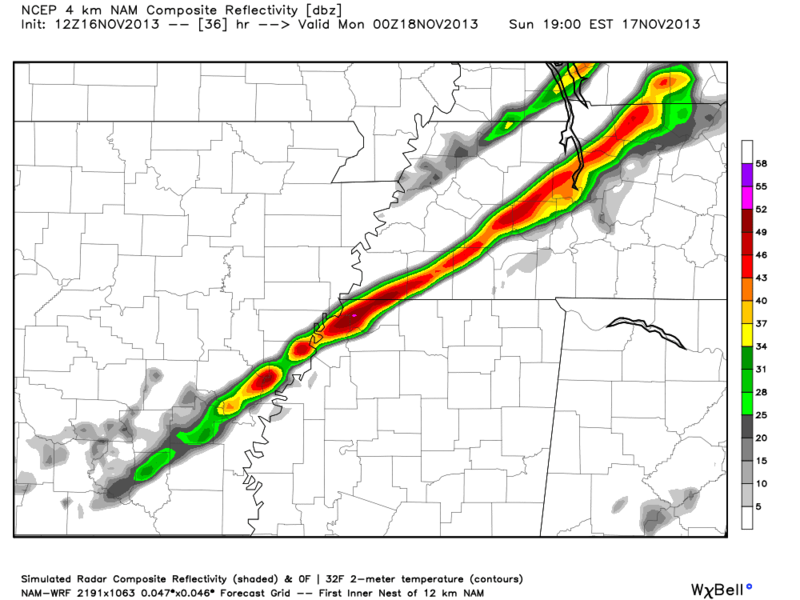 Hi-res NAM model (as above) showing "forecast radar" at 6pm Sunday. A line of storms will likely form along the cold front. Again, exact storm timing is not certain, but should be close to this time. To recap: scattered storms and showers are likely after 3am Sunday until mid-morning, followed by a break in the action and quickly warming temperatures along with windy conditions. A few more storms are possible by late afternoon but the last round of storms will occur along the cold front in the early evening. The severe weather threat is not zero (a Slight Risk is in effect), but does not seem particularly high. Further north, a much more significant threat is unfolding. Consider where you will be during potential storms and be sure you have a way to get severe weather watches and warnings if they are issued. 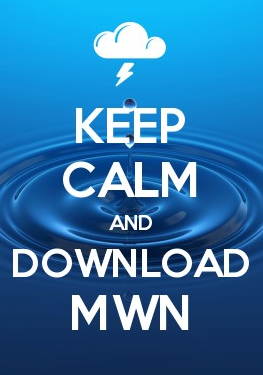 We highly recommend the MWN mobile app with StormWatch+. Links are provided below. We'll provide nowcasting coverage throughout the day tomorrow to keep you informed via our social channels, also below. The Mid-South has been quite chilly as of late with dry air, clear skies, and calm wind managing to drop temperatures into the 20's the past couple of nights. That diurnal cold trend ends tonight with increasing moisture/clouds and southerly winds. This change in the weather is important leading up to Sunday because thunderstorms are fueled by water vapor and the warm temperatures that accompany them. You can thank the Gulf of Mexico for potential severe weather by being so generous to supply plenty of moisture in a relatively short time frame. Lets take a look at some details. Infrared satellite imagery valid at 2332z (5:32 PM CST). Infrared satellite imagery reveals cloud cover surging toward the northeast from the western Gulf of Mexico. Observed dewpoints in eastern Texas and western Louisiana are in the 50's while Memphis is still hovering around 20 at the time of this post. Our dewpoints will increase rapidly overnight and will continue to increase as we approach Sunday. The Weather Prediction Center's 60-hr forecast of fronts/pressure and weather, valid 00z Sunday (6:00 PM Saturday). The above image, valid Saturday evening at 6PM, indicates the formation of a surface low pressure system. This low in eastern Colorado will provide the cold front responsible for a line of thunderstorms approaching the Mid-South the latter half of Sunday. But remember, without the days of building moisture the initiation of the thunderstorms would not be possible. Perhaps the most important feature that we will keep an eye on will be the state of the atmosphere during the day on Sunday. Depending on many specifics, thunderstorm initiation could occur prior to the arrival of the line of storms on Sunday. If this is the case, this would be the period of time with the highest risk of severe weather. This is primarily due to the storms being in a more favorable, isolated environment. Tornadoes, large hail, and damaging winds are all a possibility if supercells are able to form ahead of the expected line of thunderstorms on Sunday. The Storm Prediction Center is monitoring a large area from the Ohio Valley to the Mid-South for potential severe weather on Sunday. With that said, now is the time to revisit your severe weather plans (we are in the heart of secondary severe weather season). As of now, you should be prepared for all types of severe weather for the entirety of Sunday. As we get closer, timing and storm mode will become more precise and of course we will pass that information on to you. 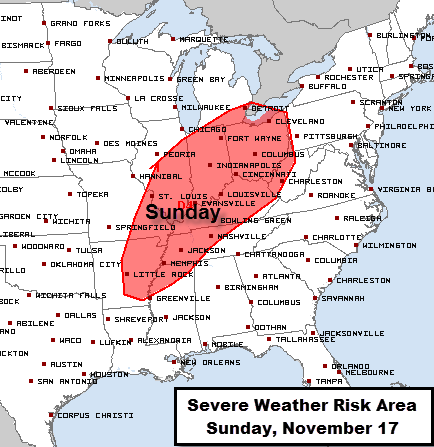 Let us know if you have any questions regarding the potential severe weather Sunday! At 10am Monday (map below), temperatures have plummeted across the Northern Plains as the front barrels through the Midwest. In fact, near-zero readings were found along the North Dakota-Canada border this morning! 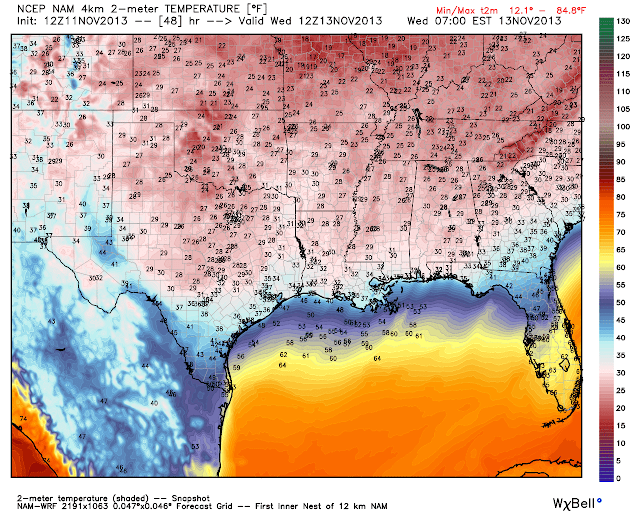 Monday 10am CST temperatures. The Arctic blast is easily noted across the north-central U.S. The front will continue to dive south, reaching the Memphis area around midnight tonight. Behind the front wind increases considerably from the north (steady at 20-25 mph with gusts to 30+) and very light rain is possible from the early morning through mid-morning hours. As clouds move out by mid-day, sunshine will help to offset the falling temperatures, but the damage will be done. Look for the mercury to be in the lower 40s on the way to work and not get much, if any, higher all day long. In fact, wind chills will be in the 30s throughout the day! By dusk, temperatures will begin falling again, reaching freezing by midnight or shortly thereafter as wind lightens. Wednesday morning lows will be in the mid to upper 20s across the metro. In fact, as shown by the high-resolution NAM model below, freezing temps could be found as far south as the central Gulf Coast Wednesday morning! Widespread teens and 20s will be found Wed morning across most of the eastern half of the U.S.
Wednesday morning lows in the southern U.S., as projected by the high-res NAM. 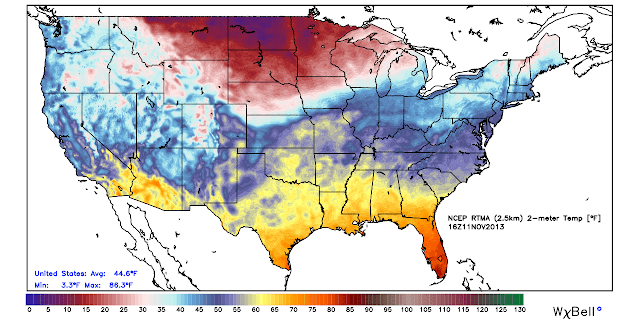 Note the sub-freezing temps as far south as Louisiana and southern MS and AL! Because the immediate metro (Shelby County) and points west and south have not experienced a freeze yet, and temperatures of 28 or less are likely for all but the city itself (where lows will still drop below freezing), a Hard Freeze Watch is in effect from 9pm Tuesday through 9am Wednesday for these areas. Tipton, Fayette, and Marshall Counties are NOT included as these areas have already experienced a freeze and the growing season has ended, even though they will also be well below freezing (more on why this is). Everyone with outdoor vegetation that is sensitive to a freeze should take precautions to protect those plants Tuesday and Wednesday nights. Fortunately, a warming trend begins by Thursday afternoon, though most areas will drop below freezing again Thursday morning. A mild and more unsettled pattern looks to emerge for the weekend. Details can be found in the MWN Forecast. As we approach mid-November, we've had a fair number of cold fronts that have dropped overnight lows near or below 40, some places in outlying areas (especially to the northeast of the metro) have touched freezing, and we've had some days with highs only in the 50s. However, the first official "winter is getting closer" cold front is due in on Tuesday, so get out those heavy coats if you haven't yet! A very cold airmass residing over north-central Canada is poised to make a run into the central portion of the U.S. then continue to dive south into the southeast U.S. as a major trough sets up over the eastern half of the nation. This will bring our coldest temperatures yet this fall and likely drop everyone - including those in the warmest parts of the Bluff City - below freezing Wednesday and Thursday mornings. Next, we look at the European model's U.S. counterpart, the GFS, for a little closer look. Below we see near-surface temperatures (actual, not departure from normal) beginning Sunday evening and running through Thursday morning. Pretty easy to spot the leading edge of cold air as it dives south. A few snapshots of near-surface temperatures from the European model show it's projections for Tuesday afternoon maximum temperatures and Thursday morning low temperatures. Note that actual daily high temperatures on Tuesday will probably occur at midnight (maybe near 50), with temps falling throughout the day. European model forecast maximum temperatures between noon-6pm Tuesday (the high for the day will likely occur at midnight, with temperatures falling throughout the day). 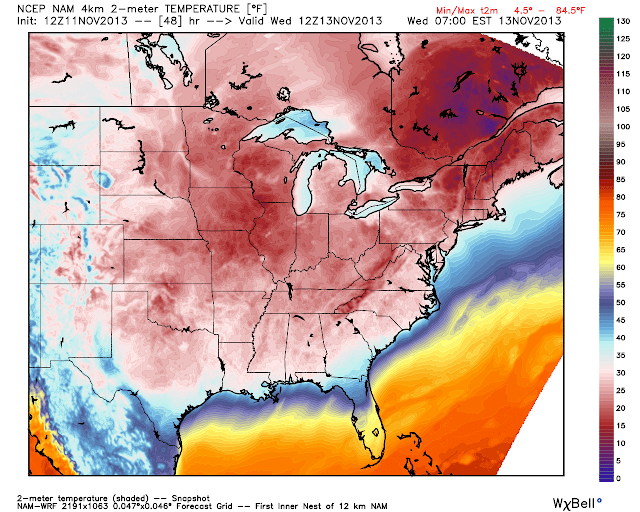 European model forecast minimum temperatures for Thursday morning. One big question that people always ask (and it's never too early in the year to ask it, of course) when major cold airmasses move into the region is the chance of precipitation, especially hoping for some good news (or bad depending on your point of view) about "non-liquid" precipitation. I kept my mouth shut on this a couple of days ago -- though trust me, I was looking -- when the European model seemed to think some "non-liquid" precipitation might fall. I knew it was too early in the season and models tend to moderate as they get closer to an event. Alas, I was right, they have. Below is the expected RAINFALL amounts from the cold front during the morning hours on Tuesday. You'll notice by the amounts (trace to a couple of hundredths) that the amounts are minimal. This will NOT be a major rain maker. I can also tell you that it is ALL LIQUID. You're going to have to wait until deeper in the season for something of the non-liquid variety. Expected rainfall amounts on Tuesday morning with this cold front are very light. The bigger story, besides the falling temps, will be the wind. In the wake of the front, Tuesday's wind will be out of the north in the 10-20 mph range at least, with gusts possibly as high as 30+ mph. 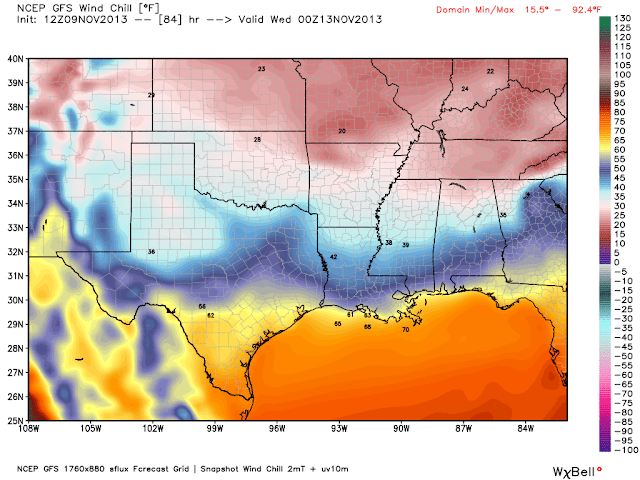 Below is the forecast wind chill values at 6pm Tuesday from the GFS -- in the 20s area-wide! Wind chill readings in the 20s are forecast early Tuesday evening as north wind reaches as high as 20-30 mph. Bottom line: Plan for a significant outbreak of Canadian air mid-week behind a Tuesday morning cold front that will drop temperatures through the 40s Tuesday, bring light rainfall during the morning, as well as 20-30 mph wind throughout the day. Lows Wednesday morning will be in the 20s to near 30, highs Wednesday (despite sunshine) will likely remain in the 40s, even cooler temperatures are possible Thursday morning, then conditions moderate back to near normal as we head towards the weekend. The complete forecast can be found on MemphisWeather.net and our mobile apps. So, are you ready for some cold weather (even for a couple days) or are you already longing for summer warmth? We enjoyed fairly mild temperatures today but the Mid-South will cool down with the passage of a cold front tomorrow night. 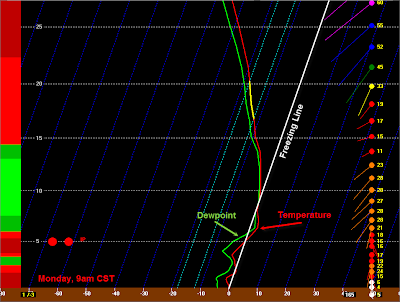 Prior to the frontal passage tomorrow, temperatures will be mild (upper 60's) with periods of rain. Visible satellite imagery valid at 2045z (2:45 PM CST). Visible satellite imagery shows vast cloudiness to our west ahead of the cold front. This image alone suggests cloudiness with periods of rain tomorrow as the system moves east. The Weather Prediction Center's 24-hr forecast of fronts/pressure and weather, valid 18z (12:00 PM CST) Wednesday. Above is the Weather Prediction Center's surface map showing positions of fronts at noon tomorrow. Chances for rain will start by mid-morning with higher probabilities of rain in the afternoon, ending with the passage of the front during the late evening. The Weather Prediction Center's 6-hour quantitative precipitation forecast from 18z Wed (12:00 PM CST Wed) through 00z Thur (6:00 PM CST Wed). As far as amounts of precipitation go, the Weather Prediction Center has near 0.30 inches during a 6 hour time frame in the evening, but we wouldn't be surprised to see rain totals closer to half an inch. Once the front and associated rain has passed, we're looking at much cooler, drier air for the end of the week. Temps will be near 60 Thursday and Friday with overnight lows dipping into the 30's. The weather was fairly benign for the month of October until the last day of the month, Halloween, produced some excitement. Fortunately predicted rain ended prior to trick-or-treating, though scattered storms just north of the metro produced one tornado touchdown - an EF-1 in Caraway, AR, east of Jonesboro - in the Mid-South. Overall temperatures were slightly above average and precipitation below average for the month. For the year, temperatures are averaging 65.4 degrees, or 0.5 degrees below normal. Climate details for October can be found below. The average temperature for the month of October was 64.6 degrees, or 0.5 degrees above normal, driven by well above average overnight low temperatures. The average high temperature was 73.7 degrees (0.7 degrees below normal) and the average low was 55.6 degrees (1.8 degrees above normal). The coolest temperature of the month was 37 degrees, reached on the 25th, while the highest temperature was 88 degrees on the 5th. There were 2 days which saw low temperatures below 40 degrees and one day in which the high did not reach 60 (55 on the 25th). Precipitation for the month totaled 3.30", which was 0.68" below the average monthly rainfall for Memphis International. There were ten calendar days with measurable rainfall, but only two which recorded at least 0.5" and one which saw 1" or more. Through October 30, annual precipitation at Memphis is 51.94", which is 9.49" above the 30-year average. The maximum 24-hour rainfall was 1.21" on the 31st. The peak wind was 45 mph from the south on the 31st with an average wind speed for the month of 6.5 mph. The average relative humidity was 69 percent and average sky cover was 50 percent. The maximum pressure for the month was 30.53" on the 25th and the lowest was 29.57" on the 31st. Click here for a daily statistical recap for Memphis International Airport. The average October temperature at Cirrus Weather Solutions was 62.4 degrees with a maximum of 87.5 degrees on the 5th and a minimum of 32.2 degrees on the 25th. There were 5 days with lows below 40 degrees and 3 days with highs below 60. Monthly precipitation was lower than at the airport and measured 2.81" via the Cirrus automated gauge and 2.85" in a manual gauge used for the CoCoRaHS program. Maximum daily precipitation was 0.88" on the 31st. For the year, the CoCoRaHS gauge at MWN has recorded 48.93" of precipitation, or almost exactly 3" less than the airport. The measured peak wind gust was 22 mph on the 31st (likely underestimated by 10-15 mph due to sheltering of the anemometer to the south). Average relative humidity was 82%. Click here for a daily recap on MemphisWeather.net. For the month of October, the average temperature error in all MWN temperature forecasts was 2.00 degrees, lower than all available computer data models and the National Weather Service forecasts with the exception of the LAMP short-range model, which only extends 25 hours into the future. MWN's forecasts extend out five periods (2.5 days, or roughly 60 hours). Over 71% of the MWN temperature forecasts for the month were within 2 degrees of the actual temperature. For dewpoint accuracy, the MWN forecast averaged 2.39 degrees error and fell within 2 degrees of the actual dewpoint nearly 65% of the time. Historical accuracy statistics can be found here. 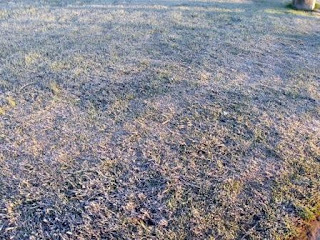 The National Weather Service issues Frost Advisories and Freeze Watches and Warnings during the Mid-South growing season to give a heads-up to agricultural interests (primarily) of cold temperatures that could damage crops and other outdoor vegetation. Since a large part of the area has seen sub-freezing temperatures already, no further watches/warnings/advisories will be issued for those parts of the Mid-South. Areas that could still see watches/warnings/advisories include Shelby County, northwest MS, and east-central AR. Minimum temperatures this fall season have fallen to freezing or below across much of west Tennessee, northeast Arkansas, the Missouri Bootheel, and northeast and north central Mississippi. 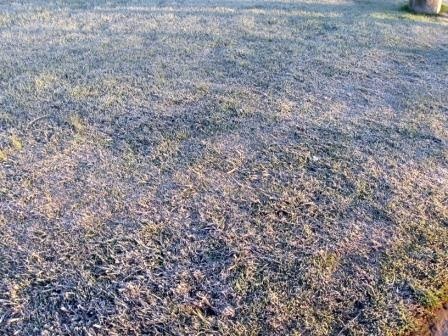 Therefore, frost/freeze headlines in this area will end for the season. The need for frost/freeze headlines will continue for east central Arkansas, northwest Mississippi and Shelby County Tennessee. This is an area roughly south of U.S. Highway 64 and west of Interstate 55. Unless a freeze is observed beforehand, then frost/freeze headlines will be issued in this area no later than November 15th. So, if a Frost Advisory is issued for Shelby County, but our friends in Fayette and Tipton Counties don't receive that advisory, this is the explanation. In the MWN coverage area, no additional headlines are expected this fall for Tipton, Fayette or Marshall Counties.